FBC Manby Bowdler, local solicitors in Wolverhampton as well as an anonymous local donor have each donated £1,000 to support and encourage two first year female engineering students as part of the University’s commitment to promoting women in science and engineering. 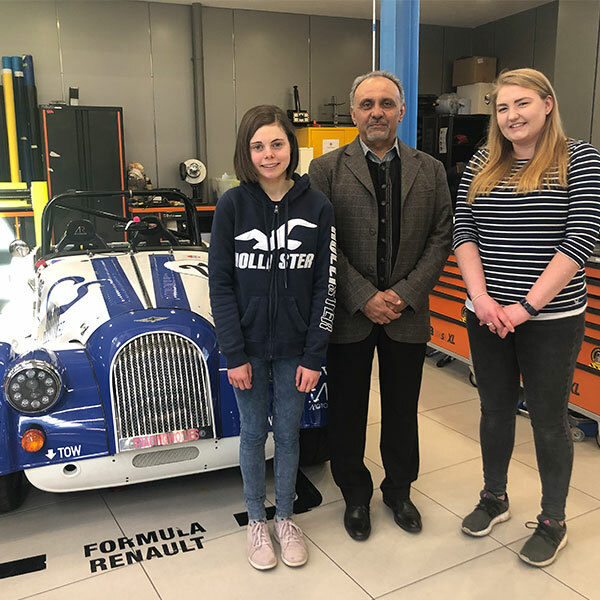 Rebecca Manton, 25, a Motorsport Engineering student from Shropshire and Aerospace Engineering student, Sally Lancaster, 20 from Telford, were presented with the scholarship money recently by Dr Syed Hasan, Head of the School of Engineering at the University’s Telford Innovation Campus. Both students study in the School of Engineering and were nominated because of their excellent achievements in their first semester exams. Rebecca, on receiving the FBC Manby Bowdler Scholarship, said: “I’ve always been interested in Formula 1 and about five or six years ago, I started competing in hill climbing competitions as a hobby so I wanted a career that was to do with something I loved. “I’m interested in how Formula 1 cars get designed so I’d like to do something with aerodynamics or design and Engineering seemed the best path to get there. Neil Lloyd, Sales Director at FBC Manby Bowdler, said: “We’re absolutely delighted to be continuing our support of female engineers through our partnership with the University of Wolverhampton. ‌Recipient of the anonymous donation, Sally, said: “It’s great that the University can offer sponsorships to encourage more women to study Engineering. I’ve always had a fascination for how things work and I always wanted to take things apart to see how they work. ‌Anyone interested in studying Engineering should register for the next Open Day on Saturday 15th June 2019. Picture caption from left to right: Sally Lancaster, Dr Syed Hasan and Rebecca Manton.